Sign the petition to lower rents! I am 27 years old and still living at home. I thought by now that I would be independent and living on my own in Brighton, the brilliant vibrant city I live and work in. Unfortunately this is not the case. Rent has risen so high in the city that a one bed flat in the area can go from £650-£750 a month. Often the property is of poor quality and little more than a studio. Factor in agency fees and council tax and an average wage can not cover this. This is happening all over the country. People are being priced out of areas they have grown up and work in. So I have started a petition to ask the government to cap private rents. We need to Impose rent controls and restrictions on private landlords, including minimum quality standards as they do in Sweden and across Europe. It is the taxpayer who is subsidising artificially low mortgages and paying fortunes to private landlords in housing benefits to make up the shortfall in what people can afford to pay. It is essential that the government implement rent caps in the private sector. Average earners have to face such inflated rents they are unable to save money to put down a deposit for a home. Lowering and capping rents would enable people to save for a mortgage or allow a more disposable income to inject into our failing enconomy. Please sign my petition by clicking here. Tags: rent controls. Bookmark the permalink. The “well why live in a trendy area” argument is a common one. Brighton and Hackney (amongst other places) are becoming gentrified so fast and sold out from under the noses of people who live and work there. Rents go up, public spaces are sold, pubs and cafes where people on low/ middle incomes can go are wiped out, and communities are dismantled. People living and working in places like Brighton didn’t ask from this to happen and it’s not them that are getting rich off it (unless they own properties or businesses in the area). Should we all just up sticks and leave our homes, families, jobs, communities etc every time the finger of gentrification encroaches? Well people will be doing a lot of moving because the sapping of affordable housing and public spaces is happening very fast and its happening across the country. Another problem is the areas with affordable housing left aren’t the areas with available jobs. We need mixed communities with different types of housing and different types of people living side by side. This isn’t only practical, it’s also needed to tackle the growing tensions and sense of alienation and hatred between different sections of society. There are lot of people who are attracted by living in a trendy hot spot such as Brighton. If someone decides they want to live in an expensive area and then make claim to the housing benefit, then that is the persons decision. Why blame the Landlords?. Brighton is a victim of its own popularity. Brighton is a hot spot and it attracts a lot of trendy people, in the way Southend-on-Sea or Margate do not. Brighton was never this popular, in fact it had fallen out of favour as people took their holidays overseas. 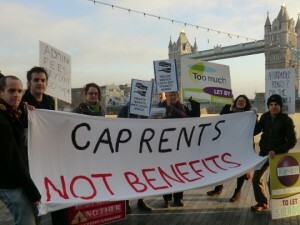 Demanding rent caps, will help tenants in popular areas such Brighton and Hackney, but it wont help tenants who live in unfashionable areas, where landlord don’t increase rents for several years. They would be forced to have yearly rent increases. The credit is due to the early pioneers who made Brighton trendy.